What are CUSTOM fit Orthotics? 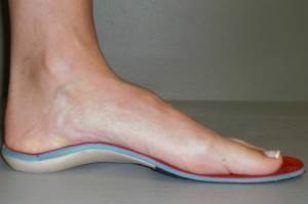 Custom fit Orthotics look like insoles, but are Bio-mechanical medical appliances that are custom made to correct your specific foot imbalances.Orthotics work on your feet much like glasses work on your eyes - reducing stress and strains on your body by bringing your feet back into proper alignment. Orthotics fit into your shoes as comfortably as an insole and has the advantage of being made from PRECISE imprints of YOUR feet. 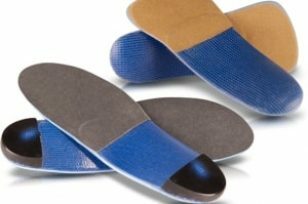 Properly made Orthotics are custom moulded to the support requirements of your feet. They help restore the normal balance and alignment of your body by gently correcting foot abnormalities. Custom Orthotics are prescribed to help support your every movement, bringing you relief from fatigue and pain, and allowing you to enjoy daily activities once again. As your foot care provider our job is to determine your needs based on your foot and bio-mechanical assessment and your findings we then recommend a gait analysis with our orthotic specialist to properly fit you for custom made Orthotics covered by insurance. Your feet have a DIRECT impact on the rest of your body. Like the foundation of a house, your feet support the weight of everything above them. When a small problem develops in your feet, a subtle change in the way you walk will cause a chain reaction of adjustments in your posture and walking mechanics. These changes can put stress on joints higher up in your body, and can lead to much more serious problems.